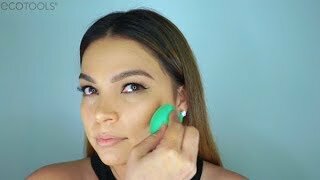 The TRI-FECTING WEDGES are a unique, multi tasking 3-in-1 tool that provide the flawless blending of a beauty sponge with the versatility of a wedge. Three unique edges control application of liquid and cream makeup for natural-looking, streak-free results. Includes 4 reusable wedges. Use wedge wet or dry. When using wet, squeeze excess water out until damp. Gently roll, stipple or dab to blend product into skin. Submerge the sponge under running water. Remove sponge from water and add a few drops of the EcoTools® Brush Shampoo. Squeeze sponge repeatedly until soap begins to lather. Continue to squeeze, but do not pinch or rub to avoid rips. Rinse under water, continuing to squeeze to remove suds. Under clean water, rinse sponge to remove sponge and makeup buildup. If buildup is still present, repeat steps 1-5. Squeeze out extra water with towel and lay flat to dry.